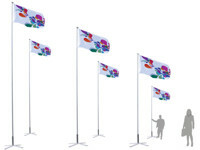 Although the outdoor flag stand is quite popular in promotional market. 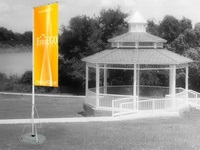 Flying banners are the ideal solution to display your message during outdoor events in an effective and stylish way. 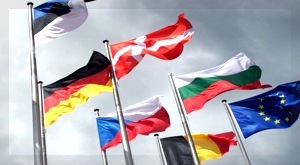 They are lightweight, easily transportable and available in a wide range of sizes. 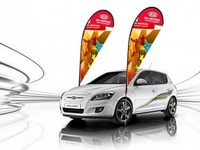 Designed for both outdoor and indoor use, teardrop banner and feather banner rotate on their bases equipped with bearings and ensure that your promotional message is always visible to the customer. 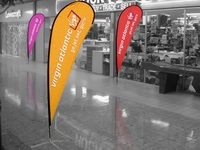 Single or double sided banner, they are especially effective as multiples, forming a boundary or avenue. 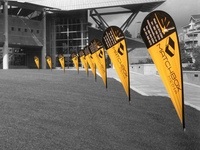 The flying banners are also great if you are looking for a personal, stylish and original touch in your indoor events.